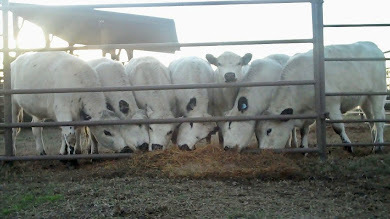 Jimmie's Blog - British White Cattle & More: BeefTalk: There Is No Profit From Calves That Cost $2.80 Per Pound? 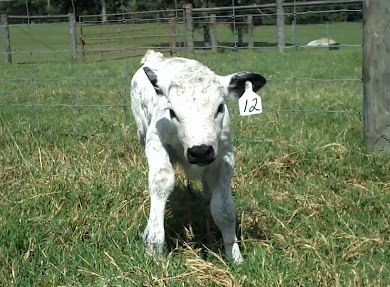 BeefTalk: There Is No Profit From Calves That Cost $2.80 Per Pound? I found this article of great interest. There is NO mention of the breed of bull chosen to cover these 26 heifers. However, great care was given to selection in terms of documented EPD's, and this bull's numbers fell in the sought after top percentile for key EPD's. Despite this, the Dickinson Center had a miserable ~30% dead or difficult calving percentage. That costs money, not just the $2.80 a pound ceasarian births, but the assists, and the deaths, as well. Such calving results are virtually unheard of in any British White herd of cattle. And we certainly don't have to worry about 'ornery' heifers that want to hurt us -- another potentially costly event. In today's economic environment cattle producers should start thinking more about the costs of these 2000 pound plus high pedigree, drowning in EPD's bulls. The cost of their potentially big calves born, or not born, successfully to heifers, is not a cost any small producer can bear. The British White breed is small in numbers, we do not have sophisticated EPD's for use in choosing sires and dams -- but do we really need them to add value to our breed? I don't think so. 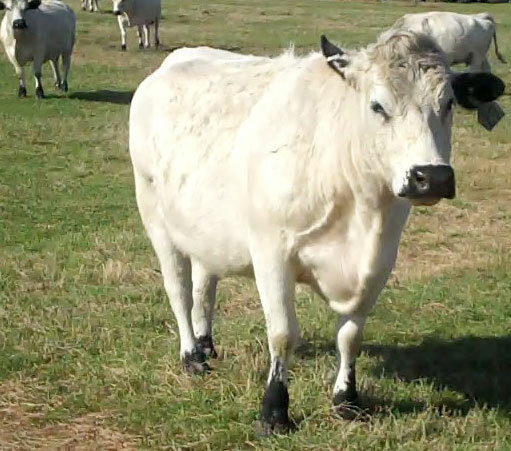 The British White breed naturally puts low birth weight calves on the ground that grow off with vigor, fatten well on grain or grass, and grade 80% plus choice and better under traditional feedlot production. 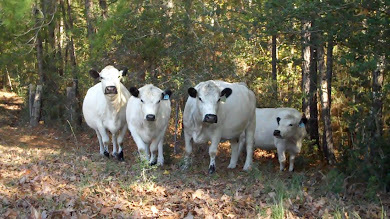 "The Dickinson Research Extension Center started calving with mixed results. The weather has not been horrendous and the first-calf heifers are up close. 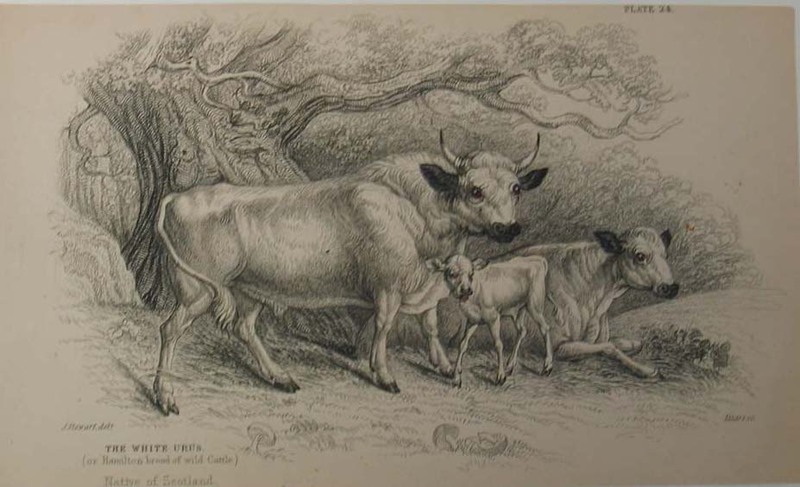 the first calf born, however, was dead. The feeling of seeing the desire and efforts of a cow that wants to be a mother and is licking and nudging her dead calf is not good. The second heifer was calving and having difficulty, so life moves on. The birth was assisted, but she ended up with a 96-pound calf. However, the heifer was belligerent and ornery. Her intent on inflicting damage to us or the calf was obvious, so out of the pen she went. She will spend her remaining days with us in the feedlot, but with us out of her reach. Fortunately, heifer 7037 was still looking for a calf and adopted the calf with no questions asked. Sometimes things actually do work out. The center has tried to keep birth weights low and calving ease high when selecting bulls for heifers. This year's sire of the calves was listed in the top 15 percent of the breed for calving ease and the top 45 percent of the breed for birth weight (the smaller birth weight expected progeny differences (EPD), the better). 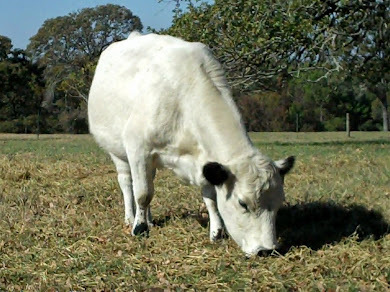 The bull was a high-growth bull that is in the upper 15 percent of the breed for weaning weight, upper 10 percent for yearling weight and has very good carcass EPD values. The bull is a good bull, but is he a heifer bull? In this case, the four calves that had difficult pulls or cesarean sections have averaged 84.5 pounds. Out of 26 heifers, we have lost three calves and assisted five births (one light assist). of the dead calves, two were born dead and the third was a cesarean section. Of the four difficult assisted births (other than the cesarean section), they are doing fine, but had big calves. to118 pounds. 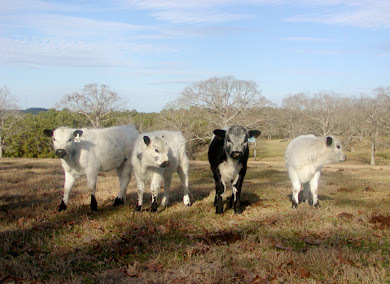 Of the 21 heifers that had no birthing problems, their calves averaged 82 pounds at birth and are doing fine. Although hard to document, when a set of calving heifers are slow to recoup after calving and the calves are cumbersome at best, you should know you are pushing the envelope. We pushed the limits and created a manageable, but difficult situation. Is the return for the added performance of the calves worthwhile? We will wait and see, but I can tell you it costs $2.80 a pound to produce a calf through cesarean section. 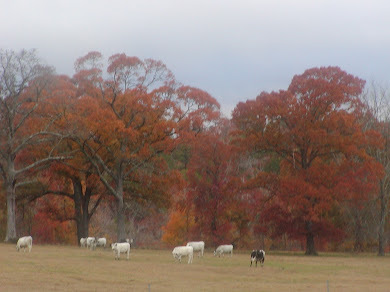 There is no profit from calves that cost $2.80 per pound and have no heartbeat."